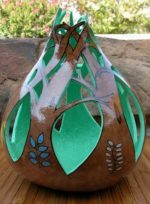 Hand-carved gourd by Cherokee artist Karen Berry. Approx. 8" x 10" x 10"